Backed by our efficient workforce, we are able to manufacture and supply a comprehensive range of Cellulose. Our range comprises Bacterial cellulose, Bamboo fibre, Carboxymethyl cellulose and Cellodextrin. We formulate all our chemicals using high-grade ingredients and other raw material that are obtained from the trusted vendors of the market. In addition to this, we pack all the chemicals using premium packaging material to ensure safety. Ethyl Geranate (32659-21-5) is colorless clear liquid. it is also known as it is use in perfumery, food flavours, Aromatic cosmetic Soap Detergent and Fraganance Industry. Storage: Keep container tightly closed. Keep container in a cool, well-ventilated area. 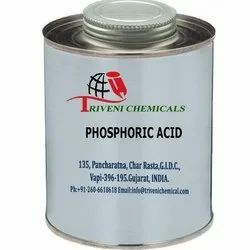 Phosphoric Acid (7664-38-2) is liquid clear. Storage: Keep container tightly closed. Keep container in a cool, well-ventilated area.